Organic is the most heavily regulated and closely monitored food system in the U.S. Unlike other eco-labels, the organic label is backed by a set of rigorous federal production and processing standards. These standards require that products bearing the USDA organic label be grown and processed without the use of toxic and synthetic pesticides and fertilizers, genetic engineering, antibiotics, synthetic growth hormones, artificial flavors, colors, preservatives, sewage sludge and irradiation. Developed through a transparent process involving the National Organic Program, the National Organic Standards Board (a citizen advisory group), industry representatives and the public, these standards provide traceability from the farm to table, ensuring that you and your family can have confidence in the organic products you buy. 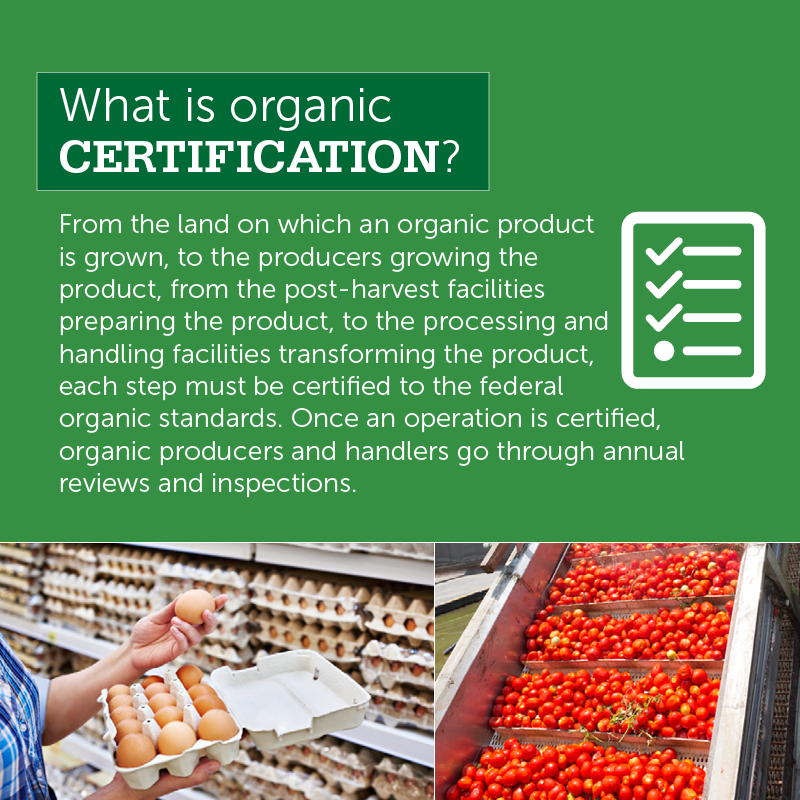 Becoming certified organic is a rigorous, multi-step process. The organic system is designed to verify that federally regulated organic production and processing methods are followed. Companies must submit a detailed application, outlining the nature of their operation, the production/handling processes they use, and the products they produce. This is called an Organic Systems Plan, and it enables inspectors and consumers alike to trace organic products from the farm to table. Rigorous announced - and unannounced -certification inspections by third-party inspectors to ensure that products bearing the organic label are grown and processed in a manner that you and your family can trust. Certifiers also audit companies’ records (i.e. : of purchases, inputs, ingredients), tracing products from their starting ingredients to their final stages of processing/production. Organic food contains no artificial flavors, colors or preservatives. Minor non-organic ingredients used in processed organic food must come from a list of approved substances, known as the "National List", that have been evaluated for safety and their impact on both human and environmental health. By law, these ingredients must make up 5% or less of the total ingredients used to make organic food. Organic processors must take a number of steps to ensure additional standards are met for how the snacks are made. This means thoroughly cleaning machinery, storing organic ingredients separate from non-organic ones to avoid mixing, and lots of record-keeping to verify that when you buy an organic product it contains only what you expect.